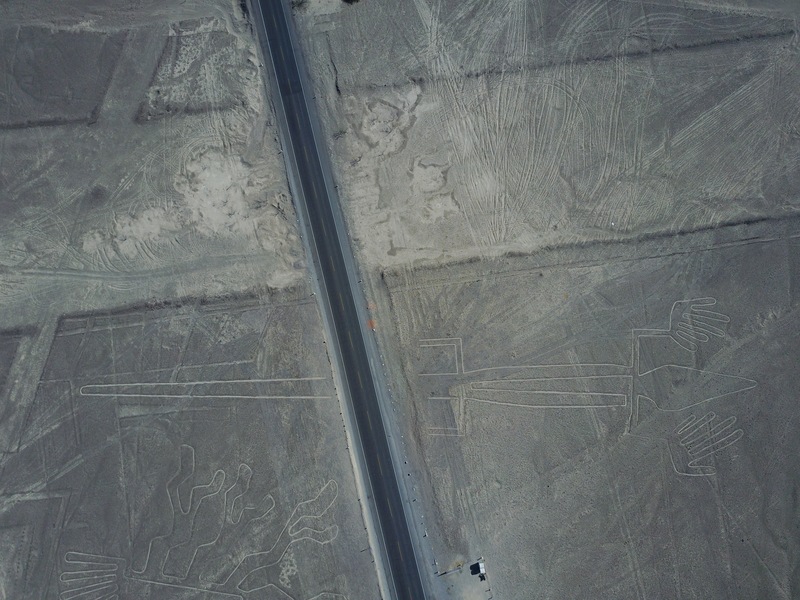 Having driven through the desert for several hours in the morning and after our brief stop flying the drone over the Nazca lines, we continued two hours to a small compound, where they make the local Pisco drink. The owner showed us around the production unit, showing where the grapes are pressed in large vats by the single women of the village dancing on them. 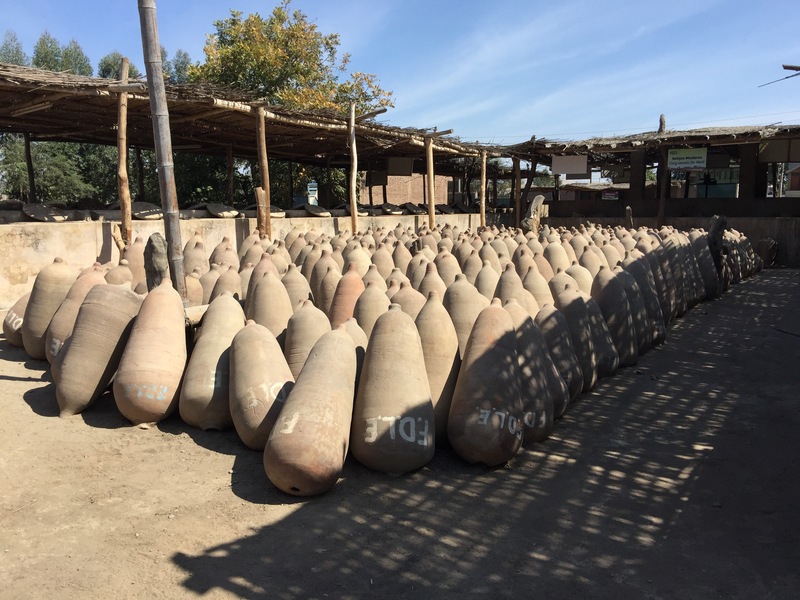 They are then poured into large (rather unhygienic) stone tanks to ferment, before going through several stages of processing to produce the pisco. After the tour we sat down and tasted shots of six different types of Pisco. They all tasted horrible but given the tour was free we felt obliged to purchase a bottle, opting for the chocolate and mint flavoured variety – the least worst of the bunch – and for $6 we felt like we were supporting the locals. 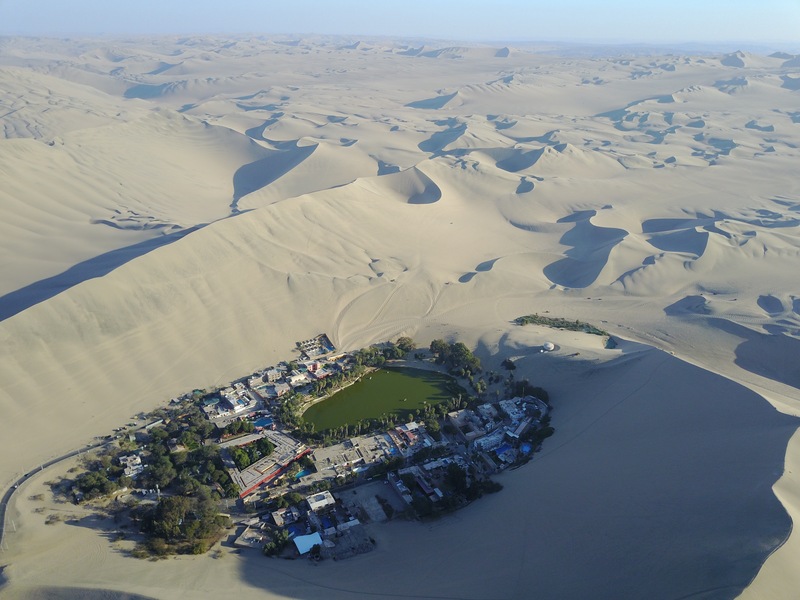 From the Pisco stop, we drove through the harsh desert for another hour before reaching Haunchina, an oasis in the sands. Straight away we got ready for our dune bashing experience. Dune buggies were waiting for us and after pre ordering some lunch, we climbed aboard and strapped in. It felt like we were in ‘Mad Max: Fury Road’ and all we needed was some war paint. Engine revving the enormous vehicle tower s over the passing cars and we accelerated into the desert over a dune. Our driver wasn’t afraid of speed as we hurled ourselves over and around several dunes. Clearly we went a bit too quickly as we broke down with a flat tyre or it burst. Either way it was hanging off the axle. Stranded in the middle of the desert we made the most of the opportunity and posed for photographs! 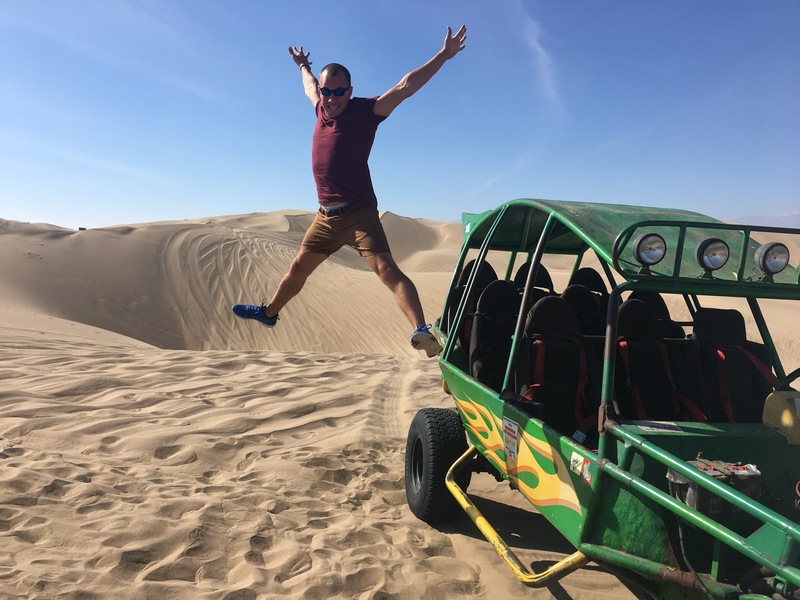 Mainly jumping of the dune buggy with the spectacular dunes in the background. Before long another buggy turned up to take us on our way. We left the driver struggling in the sand and moved on. This driver was slightly more reserved but seemed to like a steep decent!! More screaming and adrenaline later, we reached the rest of our other group. It turned out their driver had come back to get us. We unloaded, did som group shots and they then went off while we waited for him to come back. 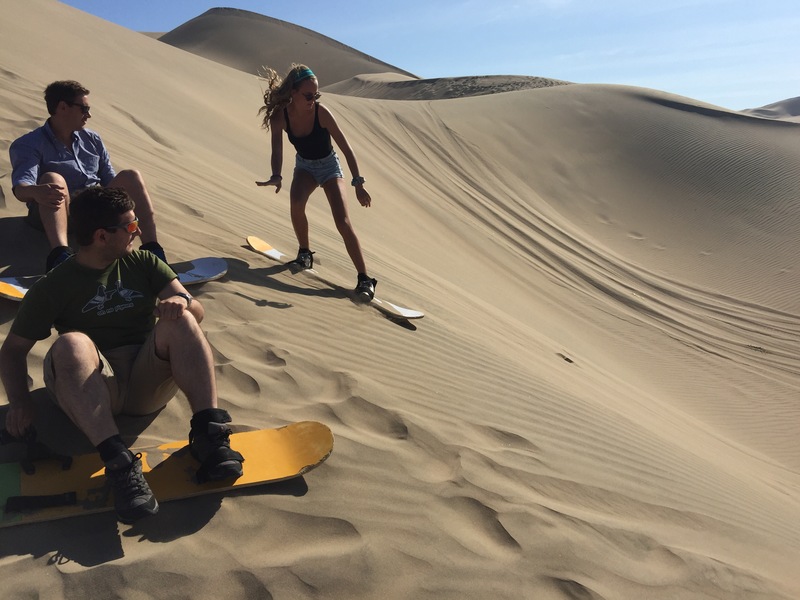 Only 10 or 25 minutes later he returned and picked us up and took us to the others who were now practising sandboarding. Standing up was near impossible but lying flat on your belly was good fun. The speed you picked up down the dune was quick. You used your feet to slow (if you wanted to) and kept going until the sand levelled out. After practising another buggy had finally turned up, so we all loaded aboard and went to a taller dune. Much taller. When you went down you were going for a good 7-10 seconds. Which doesn’t sound much but when you are zipping at speed it really is. With everyone having completed that dune the buggies came down and took us to an even steeper one. Here I raced James (but he won). Mike opted to stay at the top and take photos. We now loaded up and headed back to the oasis. But first their was time for more dune bashing!!! Back at the oasis our lunch was waiting and some people had a quick dip in the pool. After an hour we were once again on our way. 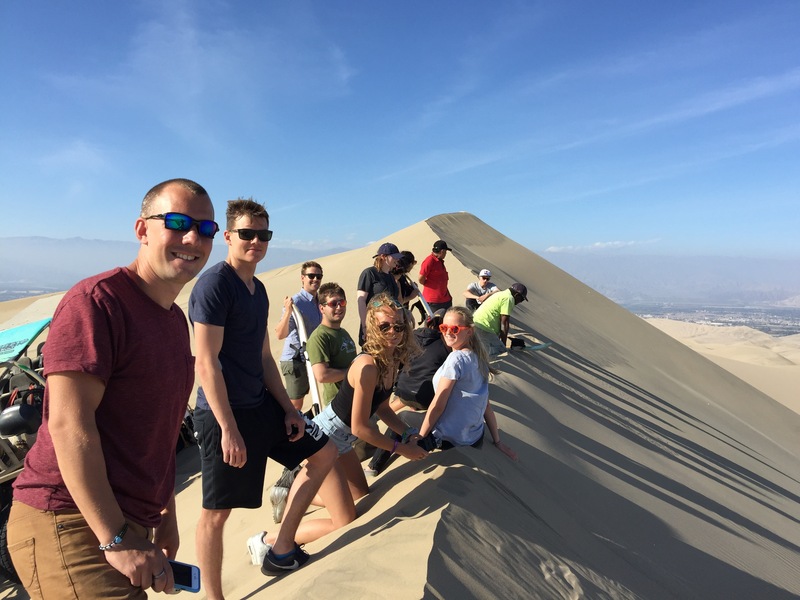 We had an overnight in Paracas and it took a few hours to get there. That night we said our thanks to Kantu our CEO guide who had been amazing through Peru. The best CEO we have had in 7 Gadventures trips. So organised and helpful and a pleasure to travel with. The following day we had a late start and some pancakes and hit the road at 1pm to Lima. Our flight was at 2am the next morning so we said our goodbyes to our new friends that evening and headed of for the next part of our travels: Galapagos!